Each year we have an abundance of rhubarb from our one plant that gives us 4 crops throughout the summer months. 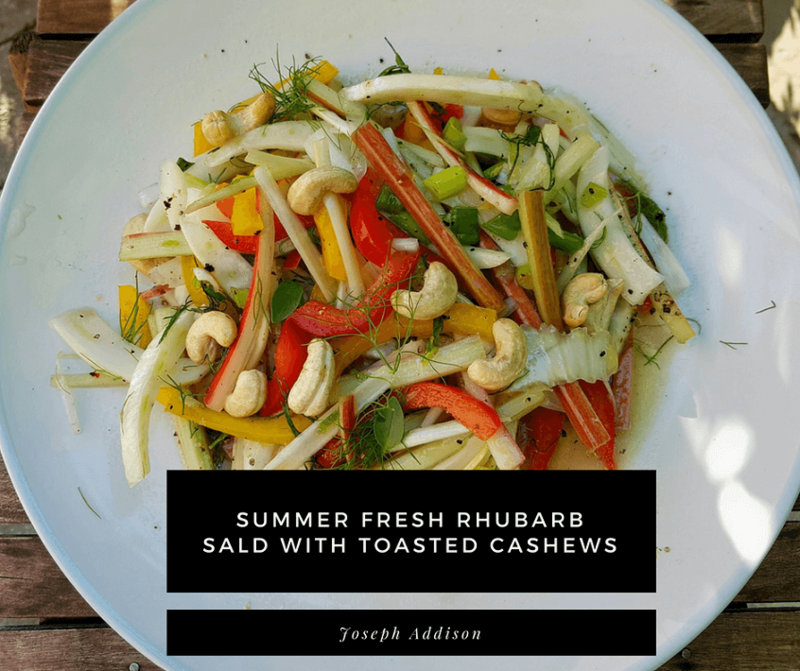 This season our new recipe is a colourful summer fresh rhubarb salad with fennel and other crisp vegetables topped with toasted cashews and tossed in a light sweet apple cider vinaigrette. YES, this salad is low-carb and perfect for the keto diet as rhubarb is low in carbs. Healthy salads are always part of our menu plan during the summer months so putting together salad combinations that are bright and unique with a homemade salad dressing always hits the spot. Summer salads in our kitchen almost always include a protein so pairing this gorgeous rhubarb salad with honey glazed BBQ’d Atlantic salmon was a hit. Mrs. CBB had a bit of her sugar-free syrup instead to keep the rhubarb salad and salmon dish keto friendly. Growing rhubarb has been an experience for Mrs. CBB and I only because she had never tried it before and I couldn’t believe how expensive it was to buy at the supermarket. Forget about buying organic as the price is even more pricier. What I love about our rhubarb plant is that it never disappoints and if you enjoy rhubarb all you really need to do is become friends with one plant and it will give you harvest after harvest every season. Our rhubarb season in Ontario starts in May and we finish harvesting into August. Depending on where you live even in Ontario this may differ but this is what happens at our house. Is rhubarb a fruit? or Is rhubarb a vegetable? Everyone wants to know so I’m going to set the record straight. Rhubarb IS…drumroll please a vegetable BUT used mainly as a fruit for its tart flavour. The crunch of rhubarb is similar to that of celery but it tastes like a very tart green apple. 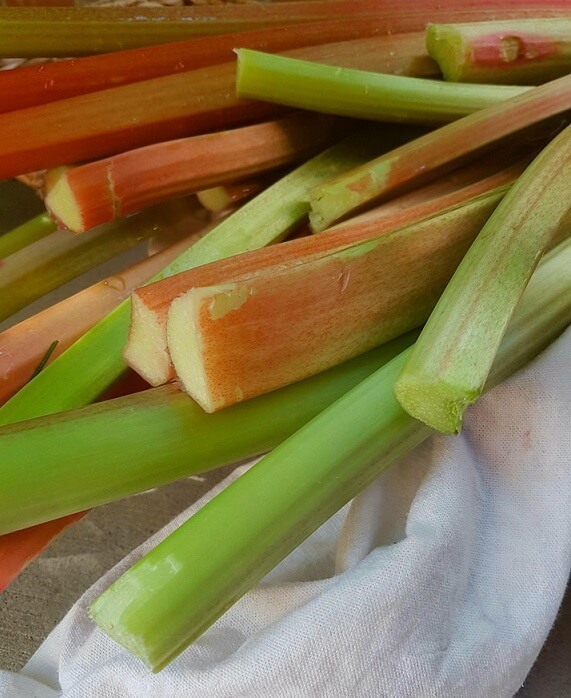 The rhubarb stalks (petioles) are long and tender and can be a bright red or pale green colour. Most people enjoy rhubarb dipped in sugar or paired with other fruits and topped with whipped cream, custards or made into a pie or other delicious baked goods. Just today not only did we make this gorgeous rhubarb salad but we also made a large pan of strawberry rhubarb custard bars. In the past we’ve used our rhubarb also to make rhubarb jam and topped ice-cream with it. I’m no pro BUT judging by the size of our rhubarb plant and where it is planted I’d say plant it right next to the down-spout of your home. When it rains it will make sure your rhubarb plant gets plenty of water. Our back garden also gets lots of sunshine during the day. This has served our rhubarb plant well over the past 20 years of its life and now gives us more rhubarb than we know what to do with. Most years we give it away to friends and family who happily come and pick some up. Rhubarb is full of nutrients and in traditional Chinese medicine was used as a laxative due to the high fiber content. Rhubarb is low in calories and carbs and has plenty of vitamin K, C, Calcium and potassium. The only part of the plant you want to avoid eating is the leaves as they are highly toxic for humans. Rhubarb leaves contain poisonous substances, including oxalic acid, which is a nephrotoxic and corrosive acid that is present in many plants. Humans have been poisoned after ingesting the leaves, a particular problem during World War I when the leaves were mistakenly recommended as a food source in Britain. 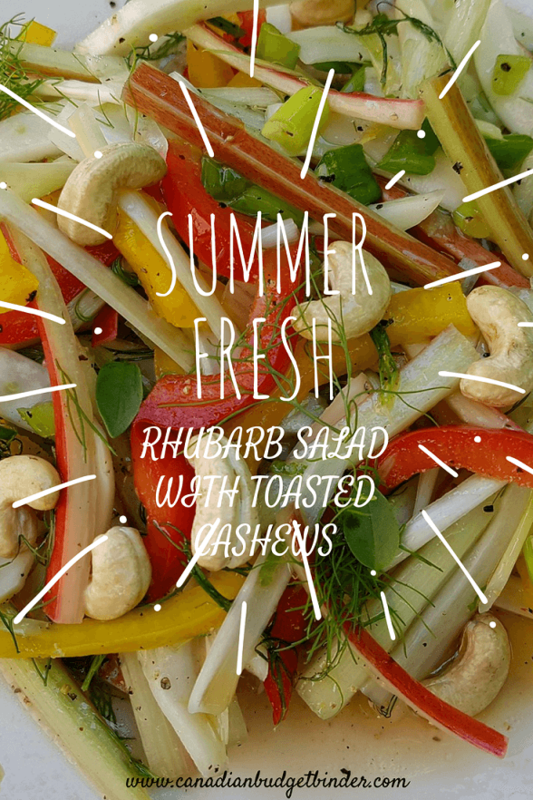 You'll love this new salad recipe that we created with rhubarb because it's unique and perfect as a side dish for your summer protein off the grill. In a jar start by mixing your salad dressing together. If you don't want the sweet salad dressing then eliminate the honey or syrup and stick with the oil, apple cider vinegar, salt and pepper. Shake the jar vigorously to combine the ingredients and set aside. On a cutting board start by cleaning your red and yellow peppers and then slicing them julienne style to keep all of the vegetables uniform. Continue with the fennel and spring onion the same way. Add as much or little of the fennel greens to your salad and mix it all up. About 30 minutes before serving your salad add the dressing to the top and mix it in with a spoon. 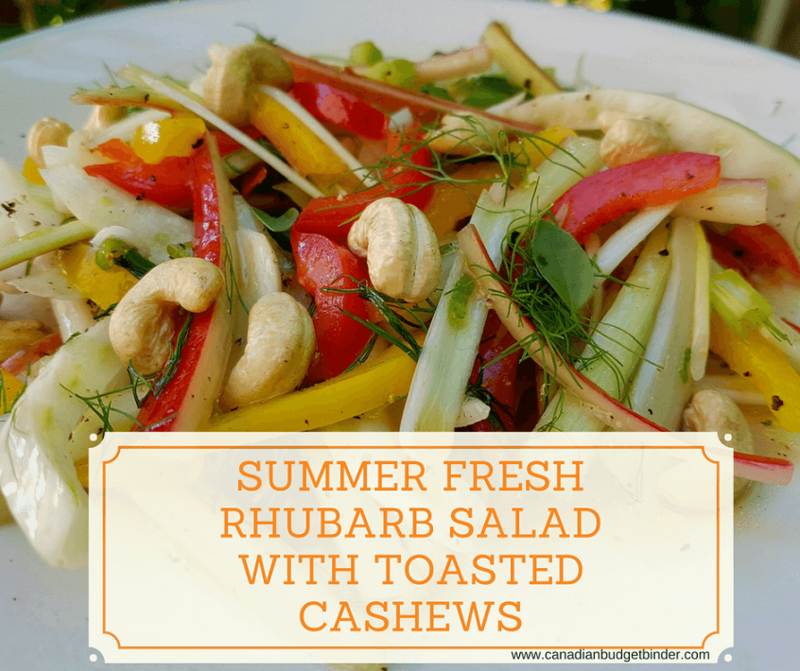 If you’d like to jazz up this rhubarb salad you could add some cooked chickpeas or even other summer vegetables that are in your crisper. What I love about this salad is that we are using rhubarb rather than enjoying it in a sweet baked dish. Sometimes it’s nice to think outside the box when you are in the kitchen because you never know what you might create. Discussion: How do you enjoy your rhubarb?